The most successful masculine to emerge from the house of Hermès in recent times is irrefutably J.C Ellena's woody/spicy triumph Terre d'Hermès... a scent launched in 2006 that went on to win the FiFi (Fragrance Foundation's) Men's Fragrance of the Year accolade in 2007. Ellena's proficient nose produced an eau de toilette that simply won the world over. Now, some 7 years on, Hermès have revisited Terre and breathed new life into its lungs with the launch of Terre d'Hermès Eau Trés Fraîche... a woody aromatic comp with an engaging thalassic slant. Just before I continue with my review, I would like to pause for a moment to address the Hermès house accord that seems to have become more conspicuous in Ellena's recent work. To my mind, Jean-Claude has looked to the house's past to unify the modern Hermès perfume stable; particularly with the masculines. If one looks back at Roudnitska's masterwork Eau d'Hermès (1951), a genderless spiced-citrus splash with leathery animalic undertones, one can distinctly hear an echo in the opening notes of Ellena's latest 'Pirate' Hermessence Épice Marine. Similarly, Bel Ami Vetiver (a new addition to the perfume portfolio in 2013) opens with a distinct Eau d'Hermès bergamot / cinnamon quickstep before veering off into classic Bel Ami territory. The house's unique fingerprint - or Hermès DNA - appears to be more prominent in contemporary releases, which I - for one - am excited to see. It may come as no surprise then, that it also makes an appearance in the arresting flight of Terre d'Hermès Eau Trés Fraîche. Eau Trés Fraîche, out of the gates, feels a little like one of the Hermès Eau de Colognes... in fact, Eau de Pamplemousse Rose springs to mind in the cursory moments it dances on skin. Grapefruit and bergamot meet the nose with a zesty tang that is somewhat less sweet than the pulpy orange opening of Terre d'Hermès... it already feels more sheer and diaphanous than its older sibling. Moments later, the familiar Eau d'Hermes prickle of spice, pale woods and leather wash over the nose, infusing it with evocations of yesteryear. But it is in this next phase that Eau Trés Fraîche starts to shift trajectory... a pelagic, watery facet shifts forward, proffering an almost saline quality. (I wonder whether the ocean-like algenone accord Ellena used in Épice Marine might have been re-introduced here)? The heart is awash with geranium that is both citrusy and aromatic, but the whole composition remains translucent and somehow feels almost blanched. Interestingly, the dirt, slate and ozonic aspects that made Terre d'Hermès a hit feel all but absent in the Fraîche version... my nose struggles to draw parallels between the pair, save for the warm woody foundation that both have in common and that both have been built on. Base notes notwithstanding, this scent is noticeably more fleeting than its big brother. Terre d'Hermès Eau Trés Fraîche is a surprising departure from the original Terre, but one cannot feel disappointed with this fragrance that promises to deliver a cooling aromatic respite from the heat over the coming European summer. 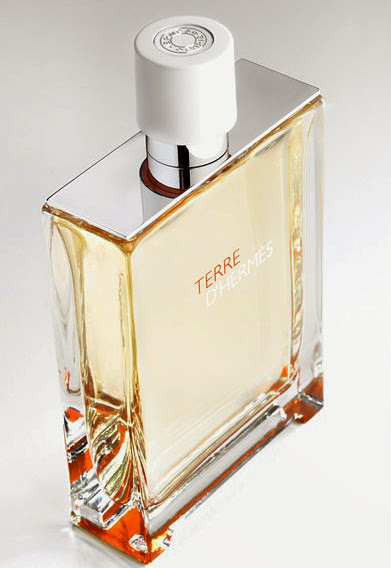 Terre d'Hermès Eau Trés Fraîche comes as a 125ml eau de toilette which is already available in France, and will be soon rolling out to other European retailers. Unfortunately for us Aussies, we can expect an August / September 2014 release to coincide with the start of our southern spring. American designer Norma Kamali flung open the doors of her first Manhattan boutique in the late 60's and has helped define the course of American fashion ever since. Known for producing that red bikini worn by Farrah Fawcett in her 1970's Charlie's Angels promos, and for popularising the use of shoulder pads in womenswear in the 80s, Norma Kamali has always done everything with an bold sweeping gesture. Fearless and plenteous is how she approached her perfume creation of ca. 1982: Incense. 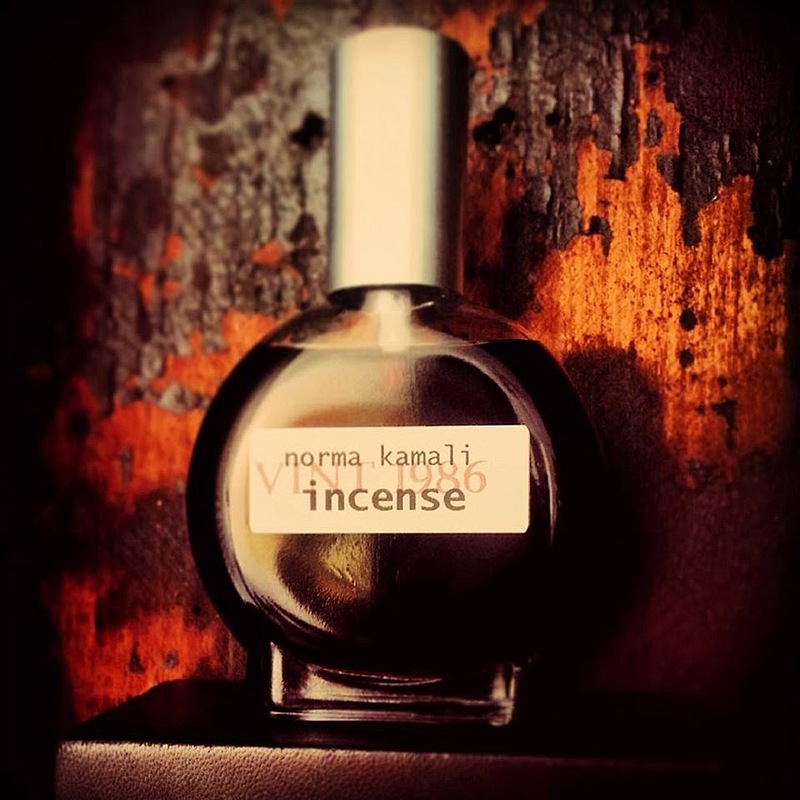 Norma Kamali in essence, created the quintessential incense fragrance against which all others might be measured... hers is Yggdrasil; the World Tree around which all others revolve. I can't think of any other incense scent - be it old or new - that wouldn't be drawn into its orbit like a bug to a mosquito light, and dispatched with a satisfying little bzzzt! But to make intelligible why would take some explaining, as anyone who has ever lifted a blotter or wrist perfumed with Norma's creation to their nose, can attest. Simply stated, it is just big. Bigger than anything your mind can conjure. Lets take a time out for a moment to define 'incense', as according to how it is represented in perfume. To my mind, there are two basic styles... those that are smoky and/or ashen, ie: incense being burned; and those that are resinous and 'sappy', ie: those redolent of both the raw tree sap and petrified 'tears'. Each of these two styles have been re-rendered time and again by perfumers the world over, but Norma Kamali's creation is perhaps the purest. All told, it feels closer to the latter. Composed of bountiful labdanum, frankincense, myrrh and copal, Incense is a perfumed cornucopia of rich, ambery resins. From the bottle, it is simply titanic... a profusion of odours rush to the back of the nose and not all of them read on the receptors as they do on paper. For beginners, my earliest perception is one of dark fruits steeped in alcohol... those dried wrinkly raisins and fragrant peels reconstituted with a dark rum or a dry woody whiskey. Fortified dessert wines from South-West Australia, crushed leaves of tarragon, and an almost dough-like facet that feels slightly creamy and glutinous... they are all in there and they register well before a mountainous wave of labdanum washes over you. A few years ago I blogged about Labdanum - a sticky resin harvested from shrubs of the Cistus variety - and it is indeed a major protagonist here. It's deeply balsamic quality floods this perfume with a rich ambery facet... one that carries with it subtle nuances of sun-soaked pollen and leaves. It serves as the monolithic backbone to this scent, to which yellow-brown kernels of myrrh, copal and frankincense affix themselves... each one of them redolent not only of the hardened sap, but also the unique characteristics of the tree they've been plucked from; some pine-like and coniferous, and some slightly woody. This openhanded layering of dense resins has erected what feels much like an impenetrable wall of perfume. This is precisely what makes Incense such a prototype for the genre... it is ceaseless and inexhaustible! True to form, it is to the disappointment of the author and a great number of faithful perfumisti to learn that Incense is no longer in production. Several years ago, it was announced that a packaging redesign would transpire before Incense and a selection of other Norma Kamali creations would be restocked. But this has since been rebuked in perfume circles as heresy. Only recently, a scant handful of 500ml flacons from 1982 were unearthed at NK HQ and offered for sale for $1200 USD a piece. At the time of writing this article, there is reportedly one flacon left... just one. Sadly, it seems this once-brilliant shining star is now on the verge of collapse. And perhaps truer still to cosmic form, the light from this supernova will reach our eyes long after it has gone... alas, with that light may come the unsettling cognizance that we have lost one of the most important perfumes of our time. Smell it while you can. You cannot imagine the numer of messages I receive by email or comment form asking why I was permanently "banned" from Basenotes. I made my departure in 2011, but now in 2014 it appears there are still quite a few people (most of them asking anonymously) who wish to know why. This mystifies me! Until now, I haven't responded to such requests, but I thought I'd spend 5 minutes to spell it out once and well so that the question never has to be asked again. Its simple: I wasn't banned - I publicly asked to have my profile removed. In a nutshell, ex-Basenoter Habanitta and I were in the process of negotiating a transaction when she was banned. I can't remember why - but I'm sure that paradigm of righteousness, moderator Stuigi, thought he had good reason. When I piped up and voiced my frustration, because I had no way of seeing my transaction through (Habanitta and I hadn't yet exchanged contact details prior to her banning), I was slapped with an infraction for "airing moderator grievances" by said moderator. Annoyed with it all, I publicly asked my profile be removed. Stuigi deleted my post requesting my account be closed, and hit the "ban" button, not the "remove account" button. The result; a blight on my name that was impossible to remove. And here I am several years on... still explaining his injudiciousness. Hurrah! After I left, a member contacted me and told me Stuigi had posted disparaging remarks about me after my departure. So I took it to that sleeping lizard, Editor and Founder Grant Osborne, telling him that an 'impartial mod' Stuigi is not. He said he would look into it. The remark was eventually removed. When I asked if the word "banned" could be removed from beneath my profile, again, he said he would look into it. More than 2 years later, and there has not been a word. Am I surprised? Well, frankly, no. I've no ill will against Basenotes, nor those that frequent it, but its no longer a place for me. I had my fun for a few years and now I seldom (if ever) look in.